A rarely told story of sisterhood, passion, and survival during World War II. Valya, 16, has always struggled with feelings of jealousy toward her older sister, Tatyana. 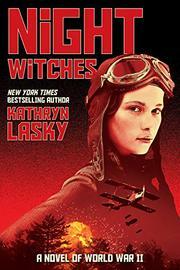 When their mother allows Tatyana to join the Soviet military and become a Night Witch, a fighter pilot of the 588th Regiment, and forces Valya to stay home, it is almost too much for Valya to bear. A naturally skilled flier, taught by her father, she knows she was born for the sky and feels her talents are desperately wasted on the ground: Stalingrad in 1941 is besieged on three sides by Nazi forces, and she knows she could make a difference. When her mother and grandmother are killed and her father declared MIA, Valya’s time arrives, and she starts her journey to become a Night Witch. Occasional infodumps slow the narrative momentum but provide interesting context to readers who may not be familiar with the Soviet Union’s involvement in World War II. Repeated references to American and British children’s literature feel forced and clunky in Valya’s first-person narration, and oddly absent are either ideological commentary on them or references to beloved Russian children’s literature. Though this inevitably begs comparison to Code Name Verity, it’s a different book: a fast-paced slice of history for younger teens.